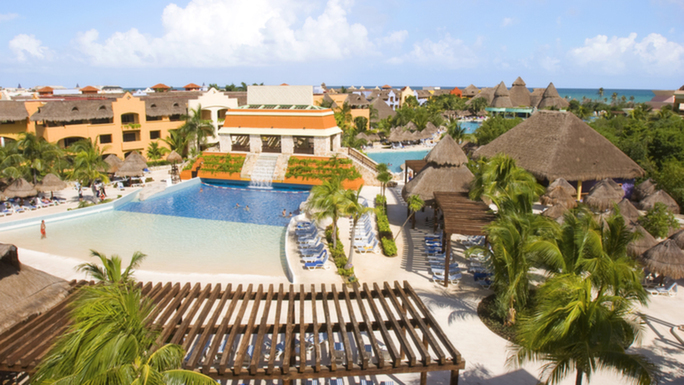 This 446 room, all inclusive, family friendly, beach-front Iberostar Paraiso Lindo Resort is amongst the finest accommodation options in the entire Riviera Maya area. The Iberostar Paraiso Lindo strives to utilize the natural world in its architecture, therefore, guests are able to witness some of the most choice wildlife in the area from the comfort of their own hotel. 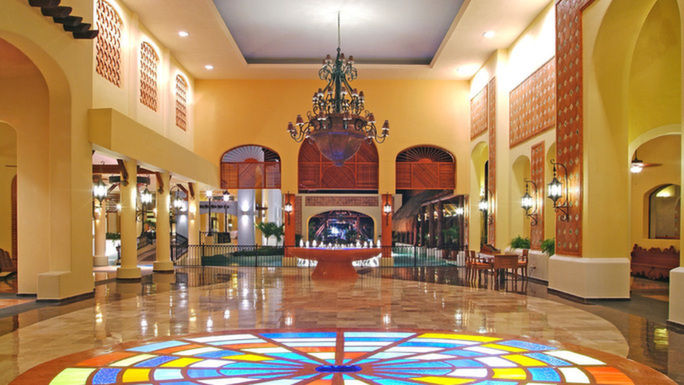 The Iberostar transmits a true sense of the region’s immense history and culture by adorning the walls with local artwork, hand carved statues, and traditional furniture. If you walk outside, you’ll find guests lounging in the lazy river, ripping body waves in the wave pool, running around with their children in the pirate ship water park, indulging in a refreshing cocktail, or simply just soaking up sun rays. 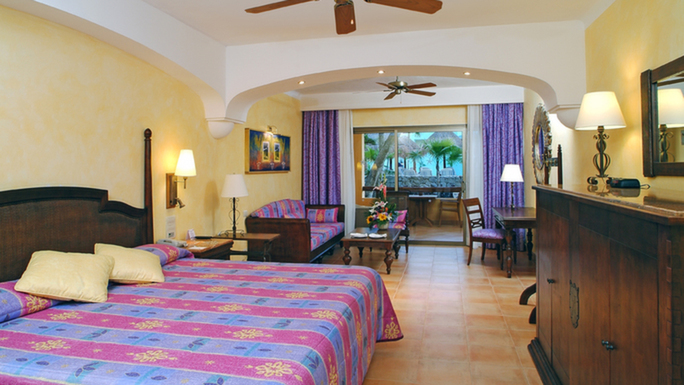 Located next door to Iberostar Paraiso Beach/Del Mar, the entire area is available for Iberostar guests. Yeah, that’s right! You will have exchange privileges at the Iberostar Paraiso Beach/Del Mar Resorts during your entire stay! So if a few of your friends in Riviera Maya are staying next door, it will be super easy to meet up with them, or grab a bite to eat. As an all inclusive resort, you’ll have total access to all restaurants and bars (including swim up pool bars) and you won’t have to worry about carrying money around! We know that exchanging your currency with local foreign currency can be a hard transition, so we’ve taken care of it for you! After you choose your desired vacation package, you pay a pre-determined all inclusive package, which includes all food and beverage costs for your vacation. Group rates for Iberostar Paraiso Lindo are very affordable and be customized to fit just about any budget. Say for example you want to organize a huge vacation for all of the relatives on your wife’s side of the family. Easy. Choose a Group Package for Iberostar Paraiso Lindo that fits your budget and interests and we can help you the rest of the way. With our group deals you’ll be able to choose from a variety of different rooms, either standard or deluxe suites, then the rest of the vacation is going to be up to you! Although there are tours in the area, the majority of your time in the Riviera Maya should be revolved around lounging, relaxing, and detoxifying your body! There are numerous activities that are offered daily, for both adults and children. Enjoy a popular water sport like, snorkeling, kayaking, and scuba lessons, or watch your kids bask in the kid-friendly water features such as the wave pool, lazy river, or water park! An 18 hole championship golf course rests inside the Iberostar complex, allowing guests to enjoy a few rounds of golf while they enjoy their dream vacation getaway. Or, guests can try archery, shooting, basketball, aqua Zumba, and much more! In addition to the kid-friendly water sports, the Iberostar Paraiso Lindo in the Riviera Maya offers a Kid’s Club for ages four to twelve. Also, there’s a teen club for ages 13 to 17, which offers very exciting activities for teenagers to participate in during the daytime. 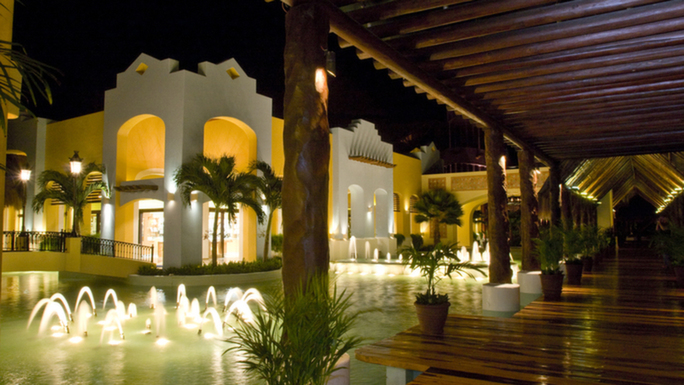 For adults, the nightclub inside the Iberostar Paraiso all inclusive complex is a great way to spend the night. You’ll be able to dance until the wee hours of the night, drink quality alcohol, and ultimately spend some quality time with the love of your life. The Iberostar Paraiso Lindo is located on the white sand beach of Playa Paraiso (meaning Paradise Beach), in between Cancun and Playa del Carmen in the Riviera Maya. Cancun and Playa del Carmen are known as two of the most party-heavy resort towns in Mexico, and are a convenient drive away from the Iberostar Paraiso Lindo Resort in the Riviera Maya. 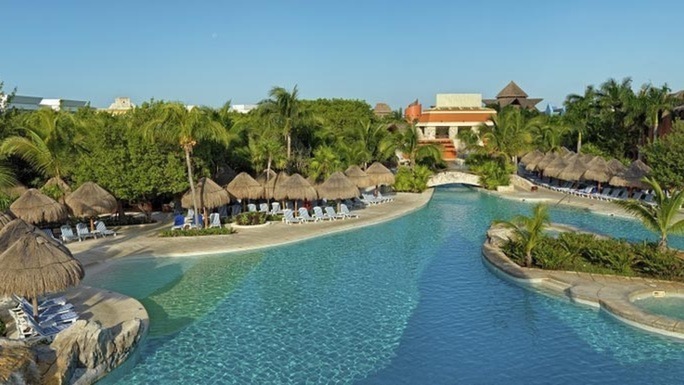 This Iberostar is one of the best Playa del Carmen all inclusive resorts and Cancun group vacation packages can easily be modified to fit just about any size of group, so choosing an Iberostar resort in the Riviera Maya can be easier than you thought! Remember that the Iberostar Paraiso Lindo is part of the Iberostar resort chain, so a lot of your vacation can be intermingled with other parts of the Iberostar. This makes things easier for guests that want to be part of a giant resort complex, for it feels as if you’re staying in a giant beach side resort palace! Don’t forget about the restaurants! The Iberostar Paraiso Lindo in the Riviera Maya, Mexico offers seven a la carte restaurants and two all you can eat buffets. These nine food options offer only the most quality of ingredients from the Riviera Maya area, giving guests a true taste of authentic flavor. The main restaurant, Laguna Pagoda, is your best spot for the late night munchie snacks; this place serves late night snacks from 11 to 1 am! Though many of the a la carte restaurants welcome walk ins, it’s best to make a reservation in advance to ensure availability, especially if you have a larger group. Those looking for a little taste of New Orleans jazz flavor should try out Jambalaya, which serves Cajun food amid a southern appeal. El Museo serves French, intricate cuisine, while there’s a Starbucks-style coffee shop that provides guests with a simpler style of pastries to enjoy. To sum it up, the Iberostar Paraiso Lindo in the Riviera Maya provides guests with a family friendly, clean, and comfortable style of resort in Mexico. There are a ton of delicious restaurants, exciting live entertainment, kid friendly activities, spacious rooms, and an abundance of other luxurious resort amenities. There truly is no reason to wait any longer to start booking your family’s next epic vacation. With remarkable Cancun group rates, Iberostar Paraiso Lindo in the Riviera Maya is without a doubt one of the best accommodation options in the area, so start booking today!